What should one be looking for in an AR-15 is a frequently asked question, so I decided to address is on (electronic) paper. Best gun deals in Seattle area! Observation one: Get a good barrel and float it. In actual fact, Glen Zediker wrote an excellent book on the subject: The Competitive AR15; The Mouse That Roared . I certainly encourage you to go and get the book, but the message, which Glen aggregates from a number of national and international level competitors is simple: for accuracy, get a top notch barrel, and float it. Brand of the lower? Doesn't matter. Material of the lower? Doesn't matter. Chrome lining in the barrel? Doesn't matter. Tightness of the coupling between the upper and the lower? Doesn't matter. Frankly, this was not intuitive for me, but when people who represent the country on international competitions say things about firearms, I tend to trust their judgment. This has more to do with your ability to shoot accurately for extended periods of time rather than the rifle's innate accuracy, but if the trigger is too heavy, it is difficult to operate consistently, and the hand gets tired faster. Get the lightest trigger possible. While rails everywhere look tacticool and all, they also interfere with your ability to shoot from a rest. Given that most ranges I go to discourage shooting offhand (because the want the frames on the targets to last a little longer), chances are that you will be shooting your rifle from the rest than with the grenade launcher attached. 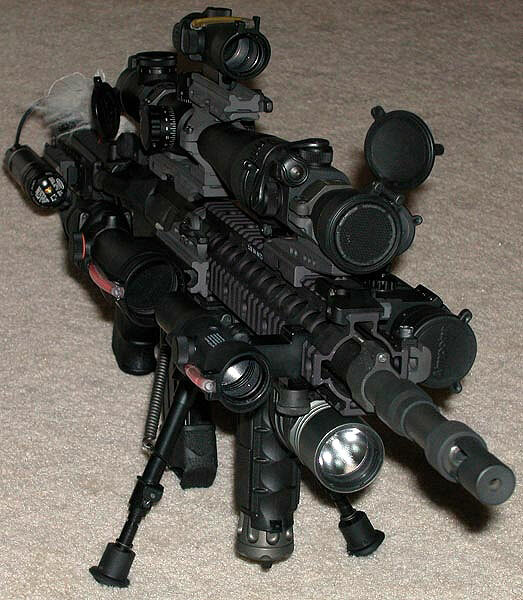 What about bipods? Well, having a rail does make them much easier to attach - however, shooting from bipod accurately is much harder than shooting from a rest, so I would certainly wait a few months at least before mounting one. But to have an option to mount one in the future, a handguard that has smooth bottom but allows attaching a sling mount to the handguard (not to the barrel!) would be ideal. For example, like this. Collapsible stocks are all the rage in the AR world, but shooting with them off the rest is an exercise of masochism (you don't really appreciate this until you try to position it on a rear shooting bag). I actually ended up replacing collapsible stocks on a couple of my rifles with a classic A2 variety. 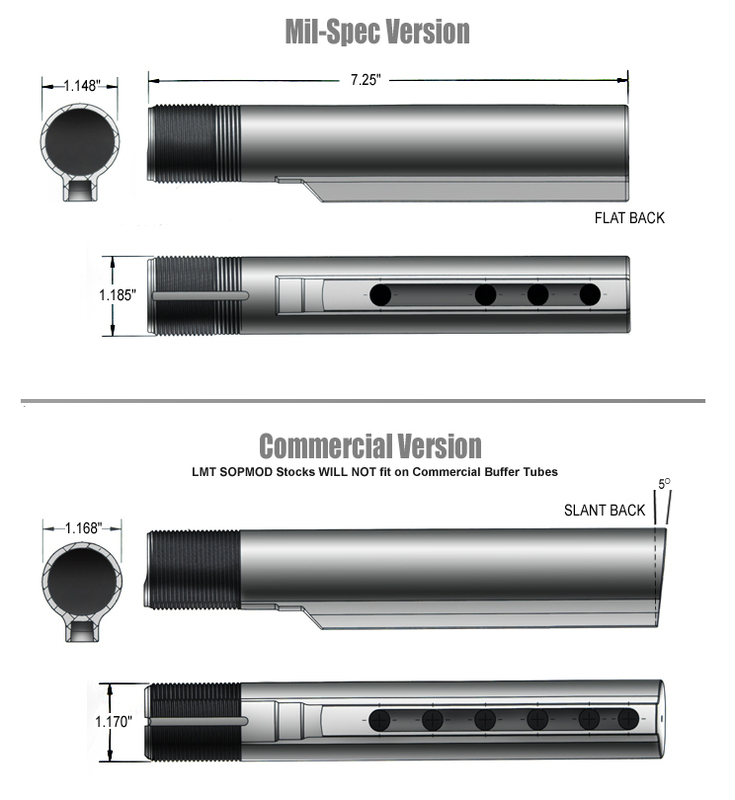 Observation five: "milspec" does not mean "good"
The ONLY difference between "milspec" AR and "commercial" AR is how the buffer tube has been manufactured. In a "commercial" implementation, the threads are cut into the tube, and in "milspec" implementation (probably, because military has unlimited supply of taxpayer money) the threads are raised above the tube. This is THE ONLY DIFFERENCE. The receivers are the same. It's just the diameter of the buffer tube. You can switch between the two for the cost of the buttstock kit ($50). There is of course no difference in functioning. EVERYTHING is interchangeable, and for the most part, in a way that does not impact accuracy. There is no need to "fit" anything to anything else. That's the genius of the design. This means that you can always replace any component, and with the exception of the barrel and some types of floating handguards, you wouldn't even need any tools. So taking these observations to a logical conclusion, here are a few strategies that you want to use for selecting your first rifle. Pick the cheapest rifle, shoot it a lot, and if you feel like improving it later, you can easily replace more of less any component. Replacing a barrel and handguard do require a punch, a brass hammer, a $20 wrench, and a can of moly grease, but everything else requires no special tools and almost no mechanical abilities. Given the iconic status of AR-15, certain brands have appeal beyond their technical characteristics. For instance. there's something to be said for owning a rifle that's almost the same as the ones used in Vietnam war. For that, you should consider buying a Colt. First, Colt is the owner of AR-15 brand. If you want a rifle called AR-15 (as opposed to BAR-15, XAR-15, or LAR-15), you don't have any other options. Second, Colt rifles (such as LE6920) have for years occupied the prime spot in the arsenals of military and law enforcement agencies, so the image of rampant Colt has become inseparable from an image of a soldier carrying the rifle. First and foremost, you need to be VERY skeptical about anything you hear about accuracy on the Internet forums. See here for details. The ONLY accuracy claims that you should trust is the ones made by the manufacturer, because they will ultimately be responsible for following through on the claim. It goes without saying also that you should only trust accuracy claims from well-established, brand-name companies. If you look closely, there are very few firearms manufacturers in general who make accuracy guarantees. Les Baer publishes impressive numbers for its rifles (even more so if you realize that it is the 10-shot group that they guarantee), but they are very, very expensive. The other manufacturer that makes accuracy guarantees in a much more affordable price range is Rock River Arms. Rock River ARs range from 3/4" for its match-targeted models to 1.5" for their tactical and specialty caliber rifles. Almost all AR-15 "for sale" ads contain a multitude of add-on features - rails, sights, bipods, lights. All of these add up to a lot of money "invested", but would you be able to recoup the cost if you were to sell the rifle? The truth is, "investing" in AR upgrades is probably one of the worse investment decisions a person could make. The rifle, when sold, will never, ever fetch anything remotely similar to what was spent on it, and is more likely to sell for about the same as a basic unadorned AR would go for. Well, what people want is highly individual. Having a zombie engraved on your lower was worth $50 to you, but it might actually be worth negative amount of money to your customer. And even if your customer wanted a zombie AR, he or she might prefer to do it later, from the next paycheck. The same goes for most other options. Secondly, most AR components - and all durable components - are cheap, commodity parts. There is absolutely no indication that a rifle built on $50 SAA receiver will shoot any differently than a $300 Noveske receiver. What really matters is the quality of the barrel - but this is also the expendable part of the rifle. So don't treat your rifle as an investment, and don't expect to recoup the money you put into it. Instead, use it to the fullest, get maximum enjoyment, and whatever is left if you ever decide to sell it is just bonus cash. 7" for bullets heavier than 70 gr. 8" for bullets heavier than 70 gr. 10" * for bullets up to 65 gr. While vast majority of commercial 223 Remington ammunition is 55-63 gr, match ammunition is typically built around Sierra Matchking 69gr, so a 9" twist is advisable.